This tutorial presents MATLAB code that generates multiple simulated asset paths which may be used in the Monte-Carlo approach to pricing options as discussed in the Monte-Carlo Methods tutorial. 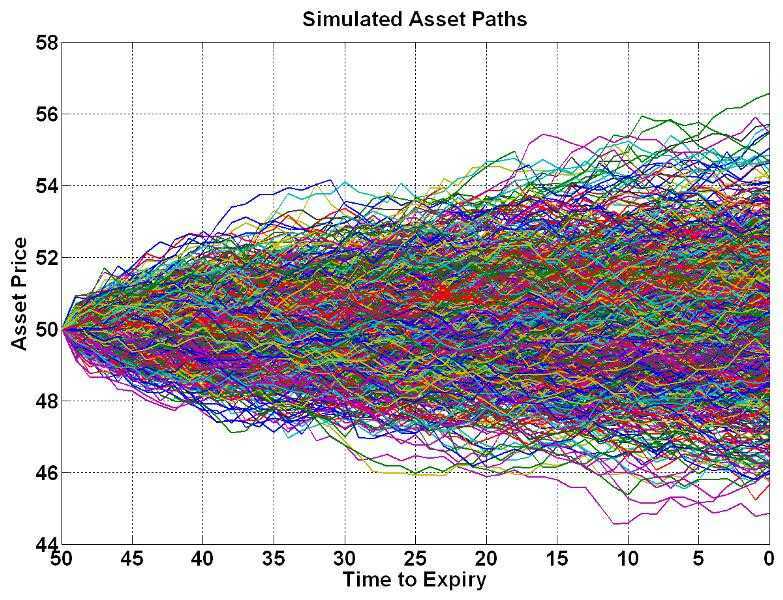 A tutorial for Generating Correlated Asset Paths in MATLAB is also available. Note that the primary purpose of the code presented here is to show how to efficiently generate multiple asset paths. The code contains no error checking and as such it is not suitable for inclusion into a larger application without appropriate modifications. The following MATLAB code gives an example of how to use the function AssetPaths, including creating (and customizing) a plot showing the generated price paths. % Script to price an Asian put option using a Monte-Carlo approach. sig = 0.1;    % expected vol. An example of using the function AssetPaths to price Asian options is given in the Pricing an Asian Option in MATLAB tutorial.